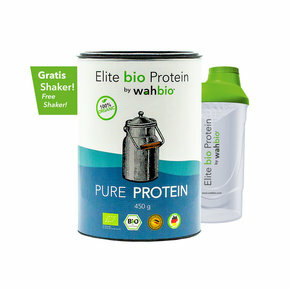 Elite Organic Protein means Elite Organic Ingredients! From cows on green pastures, starts the journey of our Organic Milk Protein Isolate. The Organic Milk Protein Isolate is derived from skim milk farmed on organic agricultures. Through Ultra filtration is the valence of valuable protein content retained. Our Organic Milk Protein Isolate will be slowly digested in the body and provides a high content of Calcium, Phosphor and Magnesium. With these ideal characteristics, our Organic Milk Protein Isolate provides an excellent foundation for our Multi Component blend. From fresh Sweet Whey and through ultrafiltration and drying, is our Organic Whey Protein Concentrate produced. Our Organic Whey Protein Concentrate is nutritionally an extremely high quality protein source and through the enzymatic hydrolysis of Lactose to Glucose und Galactose, practically Lactose free. Due to the very high biological valency of this protein source, our Organic Whey Protein Concentrate will be absorbed by the body quickly. 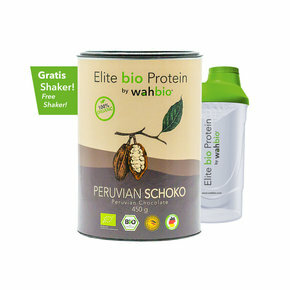 The third protein component is a carefully selected bio soy protein isolate. This is not the pure soy bean, but the soy protein content. The bio soybeans are de-oiled and extracted without further ado. By means of spray-drying, the natural protein dispersed in water is converted into a light, high-percentage vegan protein in powder form. What remains is a vegetable protein. A special feature of this is the fact that the soy protein is one of the very few plant proteins that has a complete amino acid spectrum. The raw material is GMO free and Organic certified. Our Organic Egg Protein originates from fresh Organic Eggs, which are certified per EU Organic regulations. The Chickens live in small herds, have the option to roam about open fields and given the option to eat Organic feeds. From these valuable Eggs is our Egg Protein produced. 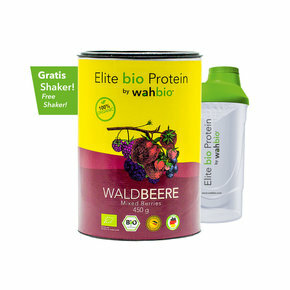 With a Biological Valency of 100 and nutritional properties similar to that of our Whey Protein Concentrate, the Biological Valency of the Elite Organic Protein blend is further improved. Our Peruvian Cacao provides a very aromatic and full bodied Chocolate flavour. From Cacao beans farmed out of Peru, the fresh Cacao beans are separated from Cacao fruit and through natural methods processed into Cacao powder. Our Organic Cacao powder contains 25% Protein and circa 35% Fibre. It also provides an abundance of important minerals. Most notably being Magnesium, Potassium, Calcium, Iron and Phosphor, as well as vitamins of the B group and antioxidants such as polyphenols. The freeze dried Organic Strawberries, Blueberries, Blackberries, Raspberries powders found in our Mixed Berries product are derived from 100% ripe, frozen fresh, aromatic Organic berries, which are after the freeze-drying process grinded into a powdered form. Through the particularly gentle freeze-drying process, the natural fruit typical characteristics such as colour, smell and taste are retained. There are most importantly, no added colours or preservatives needed! 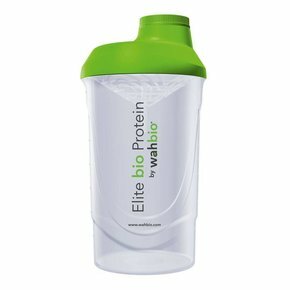 Shaker: BEP and DEHP free, 800ml capacity, 100% leak proof, Microwave, dishwasher and freezer safe. Our proprietary Multi component Blend with a full bodied and aromatic Peruvian Chocolate flavour. Made with 100% Organic Peruvian Cacao from lands believed as the origin of the Cacao tree. Our proprietary Multi component Blend with a delicious Mixed Berries flavour. Made with 100% Organic grown Strawberries, Blueberries, Blackberries and Raspberries.